Can Protein Drinks Cause Upset Stomach? 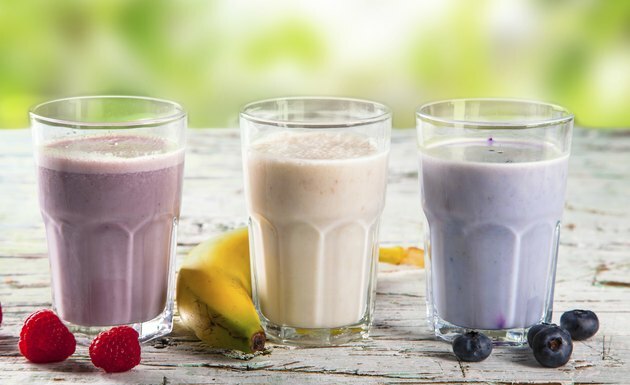 Protein drinks can make convenient post-workout snacks or meal replacements when you're pressed for time, but they have their downsides as well. Although the primary ingredients in most protein shakes are safe for the majority of healthy adults, they don't agree with everyone, and it is possible to get an upset stomach from a protein supplement. There are dozens of varieties of protein drinks and powders on the market, and many of them consist of whey protein. Whey is a milk-based protein that contains all essential amino acids and is easy and quick to digest. It has a lot of pros, but taking too much can be a concern. In large doses, whey protein can cause upset stomach and related symptoms such as bloating, cramps and more frequent bowel movements. If you have lactose intolerance or a milk allergy, downing shakes made with dairy-based whey or casein proteins can lead to digestive discomfort. Whey and casein protein powders are processed and filtered to remove some lactose before they are packaged and sold, but the amount of lactose in a supplement can vary widely from brand to brand. If you want a dairy-based protein but suffer from lactose intolerance, it's best to choose whey protein isolate, which has undergone additional filtering to remove all or nearly all of its lactose. Some commercial protein drinks contain more than what's listed on their labels -- and those extra "ingredients" can cause upset stomach as well as other health problems. According to an article published in 2010 by "Consumer Reports" magazine, every single protein supplement in 15 different drink samples tested positive for traces of a harmful heavy metal such as lead, cadmium, mercury or arsenic. If left untreated, heavy metal toxicity can cause nausea, cramping, vomiting or even mania and convulsions. If you try a protein drink and it seems to give you a stomachache, that doesn't mean all other protein supplements will affect you in the same way. Before writing them off, try a drink made with a different source. If you drank a casein or whey shake, for example, go for a powder made with a plant-based protein like soy, brown rice, hemp or pea. See your doctor before you begin using any protein supplement, especially if you have food allergies. Does Taking Whey Protein Cause Stomach Problems or Diarrhea?